Ocean view, across the street from the beach and the beach club pools and restaurant.Amenity cards for The Seabrook Island Club. NEWLY RENOVATED BUILDING! Overlooking Seabrook's magnificent oceanfront, this bright, airy villa is the ultimate in luxury and comfort. Panoramic views overlooking the Atlantic Ocean also include playful dolphin, pelicans, sailboats, shrimp boats and breath-taking sunrises and sunsets. 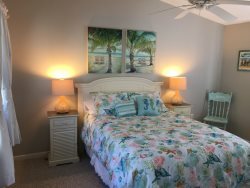 This two bedroom, non-smoking villa is located across a quiet street from our Seabrook Island Club pools, recreation and fitness pavilion, oceanfront club restaurants as well as adjacent to golf facilities including a Robert Trent Jones, Sr. designed course. 2930 Atrium Villa offers immediate proximity to the ultimate locations at the heart of Seabrook Island. You will enjoy near-perfect year-round weather, wide sandy beaches and ample places for biking, fishing, wildlife watching. From our private deck, enjoy the graceful beauty of dolphins swimming just off the beach. Bicycles:Available for rent at reasonable prices. Kayak / Canoe:Available at Bohicket Marina.